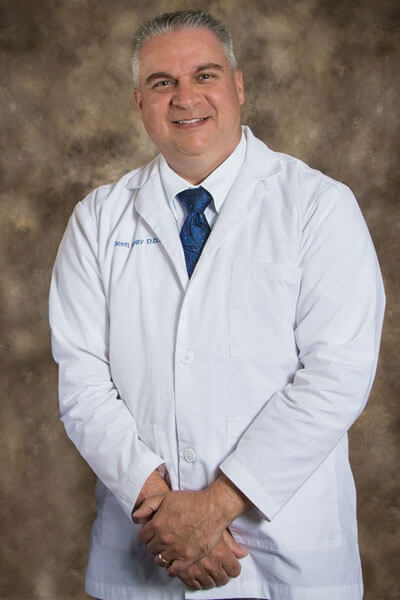 An Elyria native, Dr. Nagy graduated from Elyria Catholic High School in 1985 before earning his undergraduate and doctorate degrees at The Ohio State University. While at OSU, Dr. Nagy, who believes strongly in serving others, worked as a dental assistant and hygienist at the Children’s Hospital’s dental clinic in Columbus. After graduating, Dr. Nagy practiced in Columbus for two years before he returned home to Elyria and opened our office. As one of the few family dentists licensed to practice I.V. sedation dentistry in the Northern Ohio area, and with implant expertise earned from the Midwest Implant Institute, Dr. Nagy serves patients with a wide variety of dental needs. However, as a family dentist, he remains committed to the importance of establishing the rapport and communication necessary to serve you and your family throughout your lives. Dr. Nagy and his wife Kathy have two children, Gregory and Danielle plus their rescue dog, Rosie.) Both children are following the family Buckeye tradition attending The Ohio State University. Their son Gregory is attending graduate school to earn a PhD degree in Biomedical science and Danielle is focusing her studies on her Human Development & Family Science major with an emphasis on Functional Medicine. Dr. Nagy and his family attend Grace Christian & Missionary Alliance Church in Middleburg Heights, Ohio, and his care and compassion drives his commitment to the highest levels of excellence in providing health care and health-related services in a caring environment to the people and families of Northern Ohio. Dr. Nagy hopes to continue the mission work that he started in our community through developing a Free Dental Clinic and internationally through his resource network for many years into the future. Dr. Nagy enjoys being near the water for relaxation. Whether boating, fishing or scuba diving, he prefers palm trees over snow-capped mountains while on break.